:There's lots of bad religion out there. But the answer isn't no religion, it's true religion: living out-publicly and communally-what we say we believe privately and individually. True religion puts flesh on the bones of faith. Resurrecting Religion offers an inspiring, stretching vision for finding our way back to the good news of our faith. 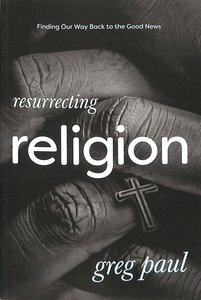 At a time when most people practice their faith in the extremes-either extremely publicly, with a legalistic, combative tone that creates division, or extremely privately, to the point that our faith becomes functionally irrelevant-award-winning author Greg Paul offers a vision for religion that is good for us and good for the world. About "Resurrecting Religion: Finding Our Way Back to the Good News"
Greg Paul is the founder and director of Sanctuary Ministries of Toronto and the pastor of the Sanctuary community. A former carpenter, Greg's twenty-five years in inner-city ministry began with Red Rain, a band that planted the seed for Sanctuary in the mid-1980s. Lead vocalist and keyboardist, Greg still performs with Red Rain in bars, universities, jails, and other venues.